The contrast between yesterday and today is enormous. Yesterday, the choice of what talk to discuss for the blog was a difficult one among a few talks that were good but great. Today, the problem is how to only choose one of a number of great ones. There were amazing talks on the optimism bias by Tali Sharot (“Smoking kills the other guy”) and racial reconciliation by Bryan Stevenson (“The opposite of poverty is not wealth but justice”). There was a 17-year-old (Taylor Wilson) who claimed to have created nuclear fusion in his garage. Joshua Foer talked about how in the past people trained, disciplined, and cultivated the ability to memorize, while today we don't bother but wonder why we forget things. Jon Ronson told a compelling story about the problems with the DSM in terms of really determining who is a psychopath (as well as many other mental illnesses) and who is not. I will be buying a number of books and expect to think more about all of them. We are letting technology take us places we don’t want to go. Devices don’t change just what we do, but who we are. There is a new skill of making eye contact while texting. We are tempted by machines that offer companionship. The illusion of companionship without the demands of friendship. Turkle is not a technophobe, but she is concerned about our constantly connecting, seldom conversing future. At the end of the talk, I gave it my first standing ovation of this TED. In a fitting irony, during much of the talk, the person next to me was texting on his iPhone. I definitely will be thinking about her talk over the coming weeks. Today I also had what I consider a quintessential TED moment outside of one of the sessions. 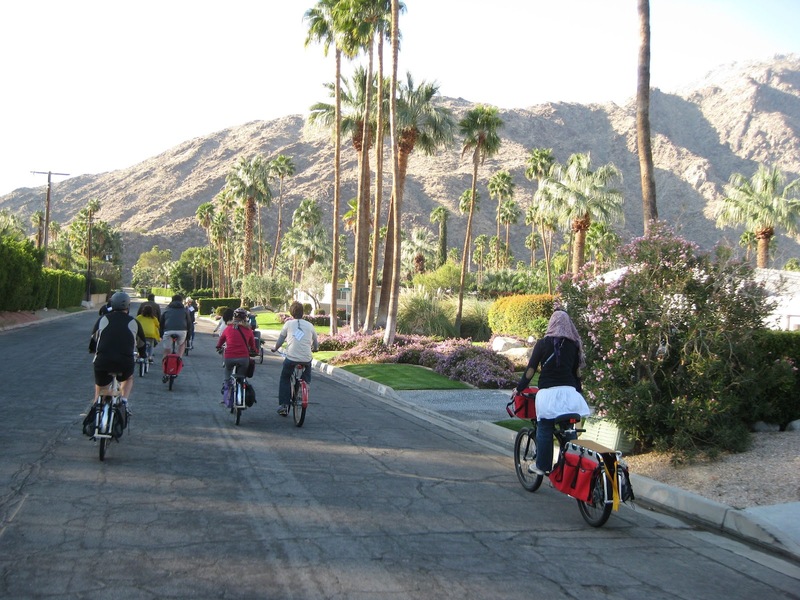 I was riding bikes with a group of TEDsters through a neighborhood of million-dollar homes singing American Pie with a woman from Cairo who was wearing a hijab. Here is a little backstory. I rented a nice road bike for a few days this week to try and get exercise in the morning. I got dressed in my cycling clothes and took my bike downstairs to ride. Unfortunately, this morning it had a flat tire. I changed the tire, but the CO2 cartridge failed to inflate it. I knew there was a TED group riding on cruiser bikes in a few minutes, so I went there in the hopes of pumping up the tire. By the time I was able to get access to the pump, the group was leaving, so I joined them. The lead bike was pulling a cart with a big speaker on it playing music. It was not easy averaging 6 miles an hour, but I decided to just have fun and talk with people. I spotted a woman riding in a hijab and struck up a conversation. She lives in Cairo, but had been educated in an American school in Abu Dahbi. We had a short but wonderful conversation about her upbringing and the uprising in Egypt. When the music playing was American Pie, we both sang along--she in her hijab on a cruiser and I with my shoes clipped into a carbon-fiber road bike wearing my God’s Glory cycling shirt. On the back it refers to Colossians 3:23, “Whatever you do, do your work heartily, as for the Lord rather than for men.” Amen.